Our Kids at Home: noticing a few things. 1. i don't think i have ever done a post without a picture. does that mean i am a visual learner? 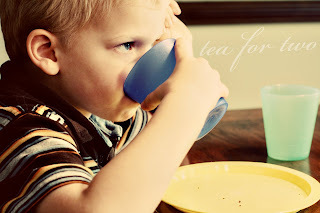 2. i have never had a tea party with my boy. 3. never knew how quickly a tea party could be over. boys don't like to hang out and chat. they sort of eat and go. 4. conversations with jack are therapy for me. jack: can i have more than this? me: well, what does God say about that? me: he asks you to be thankful for what you have. jack: can i have more brownie? me: i think you need to be thankful for what you have. jack: mama, what does God ask you to do? jack: he tells you to give me more. i get it sweet boy! more! more! more! don't we always just want more! Lord, i pray today that you are enough. this convo sounds SO familiar! I usually get this response about "more"...Mama, freely you have received freely give...HMMMM Love it! And love you! This boy uses logic very well. I am so impressed but also had to chuckle. I just love to read about these precious little moments.